Morrilton Collection outdoor wall lanterns feature a modern style that blends well with any exterior decor. These residential wall mounted fixtures are built with a protective solid black finish over steel construction to look great and last for years to come. The unique design focuses the light downward where you need it the most. THREE YEARS LIMITED WARRANTY from the original date of purchase against defects in material and workmanship. This warranty is limited up to the amount of original purchase price of the product, excluding any installation nor repair labour cost .For any inquires call 1-800-345-0542. Home Decorators Collection energy saving technology introduces new LED outdoor wall mount lanterns for a beautiful illumination with an environmental advantage. The contemporary style of this lantern complements the exterior decor of transitional/contemporary styled homes detailed with sand black finish. The LED module virtually eliminates maintenance. The Home Decorators Collection is easy to install and is sure to be a compliment to the exterior of your home. Home Decorators Collection energy saving technology introduces new LED outdoor wall mount lanterns for a beautiful illumination with an environmental advantage. The contemporary style of this lantern complements the exterior decor of transitional/contemporary styled homes detailed with oil rubbed bronze finish with gold highlights. The LED module virtually eliminates maintenance. The Home Decorators Collection is easy to install and is sure to be a compliment to the exterior of your home. Add a modern touch to your household exterior with this cylindrical 1-Light Black Outdoor Wall Lantern from Progress Lighting. Measuring 5-inch Dia and 7-1/4-inch H with heavy-duty aluminum construction, it has a closed top and open bottom to shine light downward on architectural features, landscape greenery or whatever borders your home. The sleek design of this wall-mount fixture offers a superb low-profile option for illuminating building exteriors. A weather-resistant powder-coated finish protects this stylish lamp from harsh environs and the fixture is UL Listed for wet locations to withstand damp conditions. Morrilton 1-Light Black Outdoor Wall Lantern Morrilton Collection outdoor wall lanterns feature a modern style that blends well with any exterior decor. 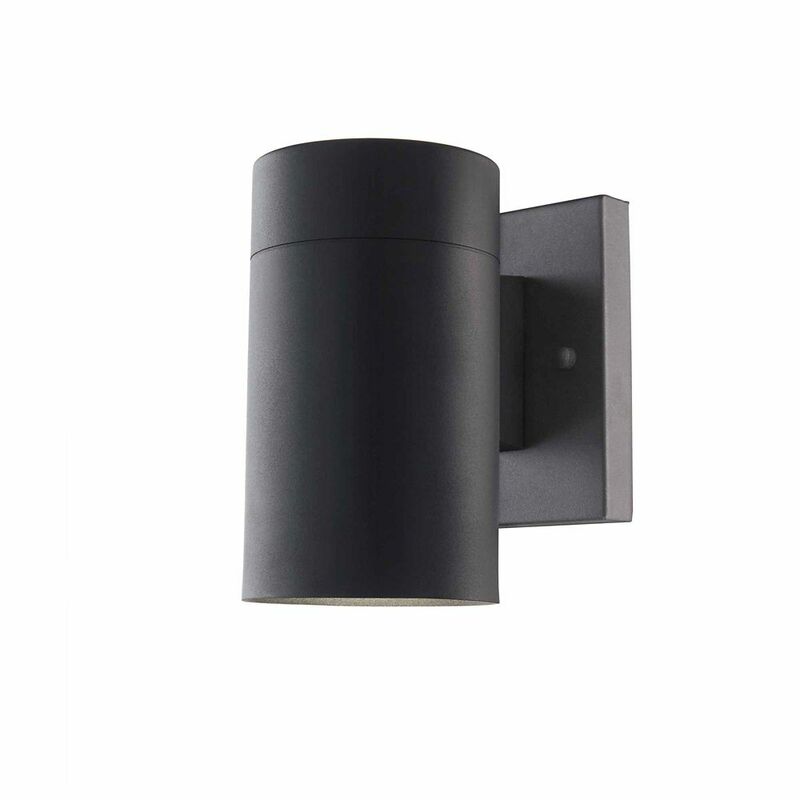 These residential wall mounted fixtures are built with a protective solid black finish over steel construction to look great and last for years to come. The unique design focuses the light downward where you need it the most. Morrilton 1-Light Black Outdoor Wall Lantern is rated 3.0 out of 5 by 2. Rated 5 out of 5 by Msefcik from Great style! I wanted a modern light that cast a downward light. This light met all our needs. Hi, inside and out is black finish.